The pen turned out to be a financial mistake for Parker (rumour has it that they cost more to make than the sticker price…) and therefore only 104,000 were made before production was stopped, making it a relatively rare pen. There is some dispute as to whether the fibretip / rollerball model is actually a T-1 or whether it’s a 75 with a titanium barrel. The most logical opinion that I’ve read suggests that it is, in fact both – that a T-1 FT/RB is a 75 Titanium. (Which is why some sites will call it a “Parker 75 Titanium Soft Tip T1” – just to cover all the bases.) 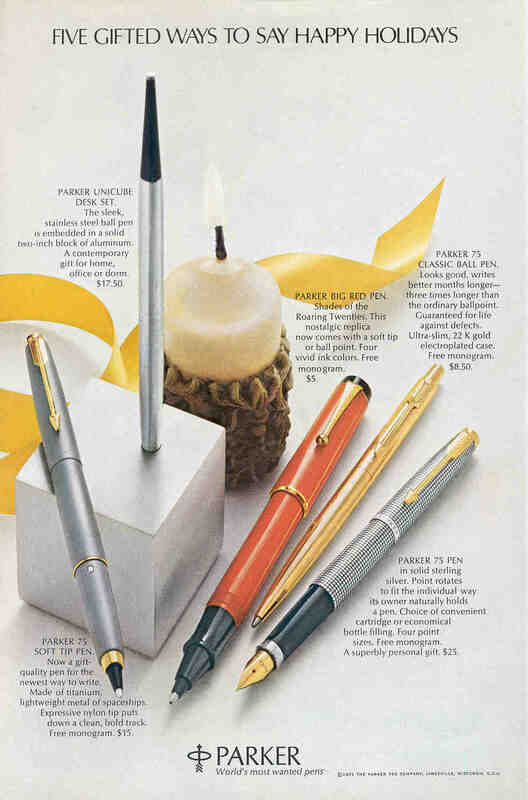 If you look at this advertisement from Parker in National Geographic Magazine, it calls the pen a “75 soft tip” made of “titanium, the lightweight metal of spaceships” however, the typical 75 actually had a plastic section, so some persons who know whereof they speak suggest that the pen in that photo was actually intended to be called a T-1 FT/RB but Parker re-branded it a 75 and then changed to the plastic section when they ran out of parts. See this page for a good discussion about this topic. Both pens have the red jewel on the bottom of the barrel, as can be seen in the photo above. However, only the fountain pen has a matching jewel on the cap, as seen in the photo below. These two pens are obviously not a set. The fountain pen is from an earlier production run than the FT/RB, as can be seen in the shade of the titanium. The lighter titanium indicates an earlier production date. Unfortunately, one of the things that made the T-1 fountain pen difficult to manufacture was the nib tip, which also proved to be a delicate affair in the real-world. If the nib met with some impact on a relatively hard surface, it tended to chip easily. And, due to the difficulty of welding to the titanium, this proved to be difficult, if not impossible to repair. Sadly, this has already happened to this particular T-1. Although the nib tip looks okay in these photos, it is, indeed chipped, thus making the pen unusable… An interesting collector’s item, but this pen will likely never write again. Quick update: The fountain pen in on a waiting list to get a new tip welded on! It’ll be interesting to see how it turns out. More info in a couple of months.